what we can do to protect your home." "You can be up to 80% safer with the installation of a burglar alarm"
Reports show that you could be up to 80% safer in your home with the installation of a burglar alarm. As well as that 90% of all convicted burglars will avoid a home that has some form of alarm system in place. 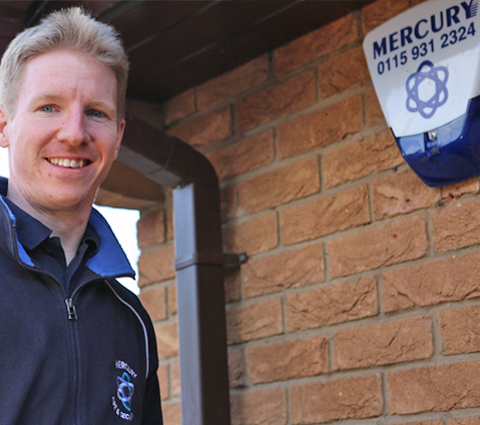 Working across Nottingham and the surrounding areas, our engineers have a wealth of experience with alarm systems and can use their expertise to tailor you a bespoke solution. We specialise in the installation of wireless alarm solutions for home owners across Nottingham and the surrounding areas. Visit our wireless alarms page to discuss more. Has a problem occurred with your burglar alarm? 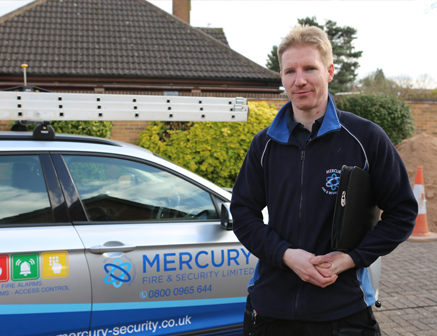 Here at Mercury Security we have all the tools to provide a first class alarm maintenance service. For more information contact us today. For added levels of security, we can implement alarm monitoring to which trained professionals will keep a watchful eye over your property. Our engineers are able to install fog cannons as part of your burglar alarm system. For more information on this contact our team today. Our team of experts are on hand 24/7 to help you with your security requirements. For more information about the services we offer please get in touch with our team today or fill out our form and our team will get back to you. Fill out our form and one of our team will be in touch as soon as possible or call us at our office today. Our range of burglar alarms offers complete flexibility, with both wired and wireless systems available depending on the setup of your home or business. Wired systems offer optimum reliability and are perfect for single properties, whereas wireless systems offer flexibility to include additional buildings as part of your system. "Speak to our team today"
For more support about our burglar alarm services, please get in touch with our team today who will happily assist you.